The mission of the Rutland Historical Society is to collect, hold, preserve and interpret historical material relating to the original Town of Rutland, Vermont which today includes: Proctor, Rutland City, Rutland Town and West Rutland. Interpreting Rutland's history infers an educational sharing with Society members and the general public by whatever activities may accomplish this goal. The Rutland Historical Society was founded in August 1969, and focuses on the history of the original town of Rutland, VT. Our Society is completely run off of volunteer time. You can see more of what we have accomplished over the years at https://rutlandhistory.com/mission/ . We publish a Quarterly magazine 4 times a year for our members, and a local television series "Historically Speaking". The Society is dedicated to sharing as much material regarding Rutland's past as possible, and have created a website, Facebook page, and Facebook group to get information to the public for free. Our membership dues are low in order to allow for more people to afford joining, but membership is not a requirement to view our collections, visit our building, use our website, or ask for research assistance. Our volunteers meet several times a week, depending on personal availability, and we welcome a wide range of interests and skills. 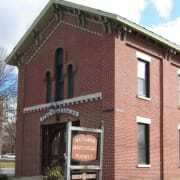 Would you recommend RUTLAND HISTORICAL SOCIETY INC? This is a great organization, with great volunteers already involved who are willing to teach, train, assist and share. The range of ages, skills, background, and interests of the volunteers is amazing, and there are many opportunities to help.